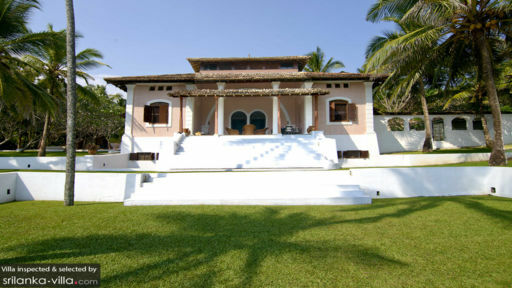 In the small coastal town of Mirissa you will find the five-bedroom Villa Pointe Sud with its sprawling gardens and a stunning infinity view of the coast and the Indian Ocean from the swimming pool. With dense tropical vegetation surrounding the villa, the entire space is made even more appealing and refreshing. 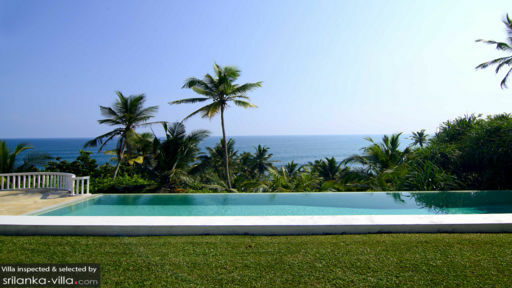 Rejuvenate and regain your strength with a clear head amidst lush foliage and clear skies. The clean air will clean out the city toxins as you relax beside the pool or the ocean. There are four uniquely-designed bedrooms at Villa Pointe Sud and a fifth bedroom down in the basement library with shelves lined with books. Four of the bedrooms, including the basement room, are furnished with queen-sized beds, whereas the fifth bedroom is furnished with single beds. The bedrooms are reminiscent of a vintage postcard with pastel colour tones, white-drape canopies, wall tapestries, and antique doors and windows. The bedrooms are air-conditioned and also feature en-suite bathrooms with all necessary amenities including walk-in showers. A gorgeous infinity-edge swimming pool is the highlight of Villa Pointe Sud with a 180-degree view of the Indian ocean along with towering palm trees and dense bushes. The beautiful scenery can be relished even from the sun loungers where you can sunbathe or bask under the tropical sun for a nice nap. The fresh island breeze will wake you up like never before and as you enjoy the salty air, your skin will thank you for life. Large parasols will keep you from the sun too, if that’s what you prefer. The stunning and luxurious-designed living area at the villa is unlike anything you’ve seen with its deep red and white tones along with mahogany furniture. As the doors open out to the ocean, inside the living area is furnished with comfortable armchairs and sofas for resting and lounging. There are antique cabinets, desks, and tables in the room to add a colonial and historical touch to the space. Upstairs in the attic you will find a media room with comfy sofas and a flat-screen TV. Downstairs in the basement, you will find bookshelves lined with bestsellers for you to scour through and lose yourself in magical worlds. The dining area is found on the porch along with another rattan sitting area, and a stunning panoramic view of the ocean. Dig into delicious meals with loved ones and have a feast with enthusiasm as you enjoy the ocean breeze and drink to your health. The kitchen is fully-equipped with modern amenities for your use or for the chef to prepare your meals! The experience staff at the villa is there to look after you during your stay, and the owner is present to manage things if ever you need anything. They will recommend sights and restaurants that you can explore in Mirissa, since they have all the local knowledge you could use. The chef is happy to whip up delicious and scrumptious meals for guests, upon request. 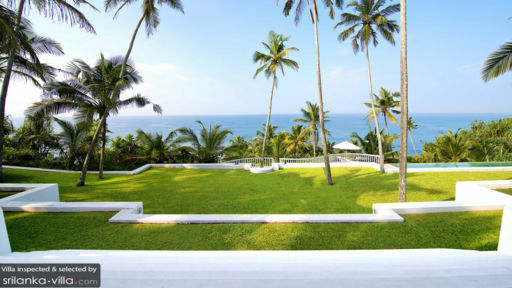 The beach around the villa is perfect for idling and relaxing, and if it’s swimming on your mind then head to nearby Mirissa beach for a fun time with kids and family. There are several beach bars and restaurants you can try out in the area as well. A nearby temple is where you can go for meditation and concentration for a peaceful experience.